We’ve traveled by boat, plane, backpack, and by bus, but you may know us best as VW Bus travelers. To be perfectly honest the bus may have brought you to our blog, but Rita does not always accompany us. We much prefer to follow the weather, seasons, and overall general feelings of what we would like to experience. 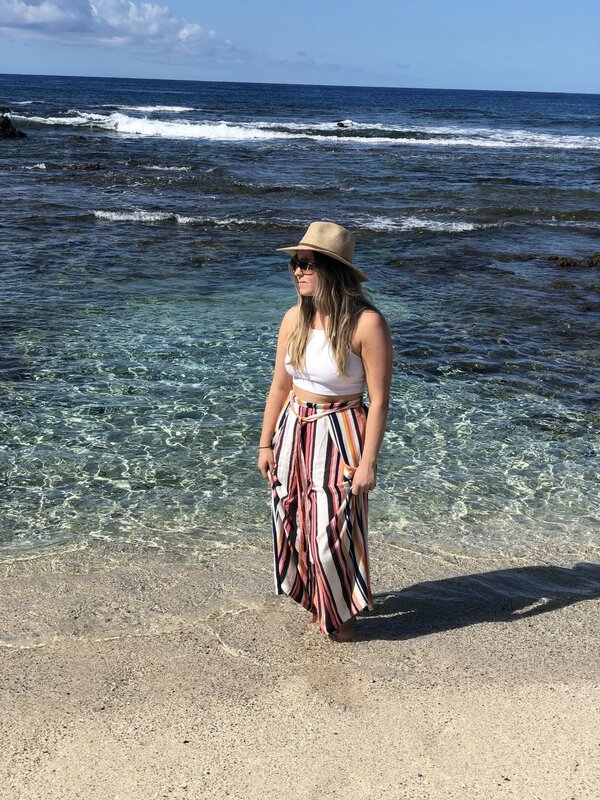 So here is a quick blog on our recent trip to the island of Hawaii. We arrived in Kona after experiencing a very rainy and icy start to winter in Alaska. It was a great time to get out and the moment we stepped out onto the tarmac in Kona a sense of relaxation overwhelmed us. We kicked off the fist day with to the Pololū Valley, a once inhabited island full of farming. It is now a jungle with a beach front that offers a glimpse of what Hawaii once was and what could be quickly as the jungle overtakes any sign of human activity. Getting there from Kona we recommend driving the mountain road through Wiamea, where you have to stop at Village Burger for their locally raised, grass fed beef burgers. Located in a food court at the mall, you might think you came to the wrong place, but don’t be fooled. The gorgonzola burger with truffle fries was a meal we won’t soon forget. After winding through what felt like ten different ecosystems, you will end up at the Polulu Valley overlook. If you have come this far, you must scurry down the 20 minute trail to the valley floor. The trail can be a bit muddy and slick depending on recent rainfall, but the views along the way and dipping your toes in the sand at the bottom will make it well worth it. Plan to spend at least an hour down here exploring around, relaxing on the black sand beach, and swinging on the rope swing. If you’re traveling with camping gear we would highly suggest spending a night or 5 camped out on the valley floor. Most of the property is private, but Hawaii’s coastline is public. You can apply for a camping permit if you want to camp down in the valley. When you make your way back up to the top of the valley you will be ready for a fresh fruit smoothie or ginger lemonade at the roadside fruit stand just down the road. If you’ve worked up an appetite try the best fish tacos on the big island at Gill’s Lanai on the side of the road. Get the fried ones instead of grilled. You’re on vacay, no need to be making healthy choices. We drove the coast road back towards Kona just before sunset. If the timing works, head to Lava Lava for happy hour sunset drinks and food. If you’re feeling adventurous and up for a sweaty walk across lava rock, make your way to the best beach on the island-Makelawena. As you can imagine the hike in means there will be less crowds than at many of the popular drive-up, tourist packed beaches. We opted for the less active option here, as Tessa can become a real creature hiking in hot temperatures without shade, and headed to check the surf at Pine Trees beach. The swell wasn’t in so we headed to the nearby Kohanaiki beach that is a popular place to camp, as you can drive a ways down the beach until you find your own private nook for a siesta beside crystal clear waters. beach 69. We were pleased with the lack of people here. Showing up after the midday rush helped. Pack a cooler with snacks (we recommend the fresh poke made daily from Costco and sweet potato chips) and the makings for your favorite cocktails and post up in a private nook on the beach and don’t move your Tommy Bahama backpack chair until well after the sun drops behind the horizon. We didn’t share the beach with more than one or two other groups of people for sunset and stayed an hour past to watch the stars fill the sky. Okay , we understand it’s vacation and who wants to wake up early? We are late sleepers but waking up before sunrise to make it to our Paradise Helicopter tour of the Big Island was a sacrifice worth making. 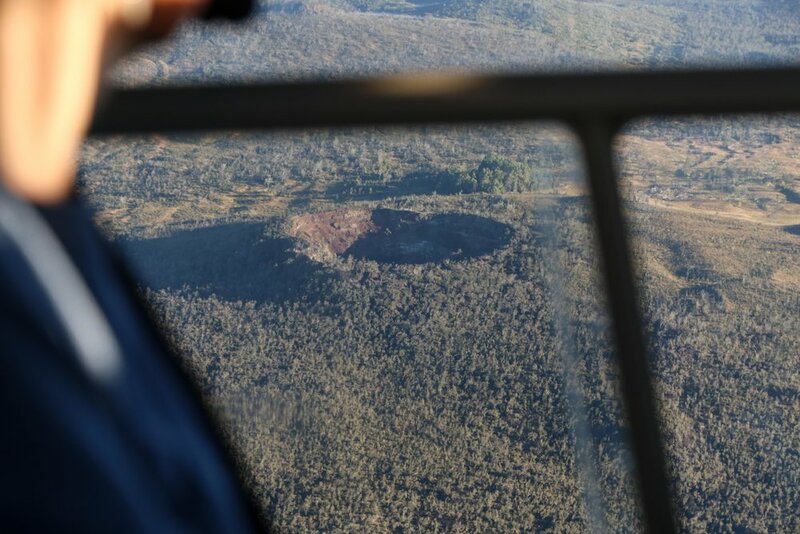 The flight lasted almost two hours, with the highlights being flying over the lava paths recently laid by the Kiluea volcano, the Kiluea crater, and following the dramatic cliffed coastline on the east side of the island until we reached Waipi’o and Waimanu Valley. 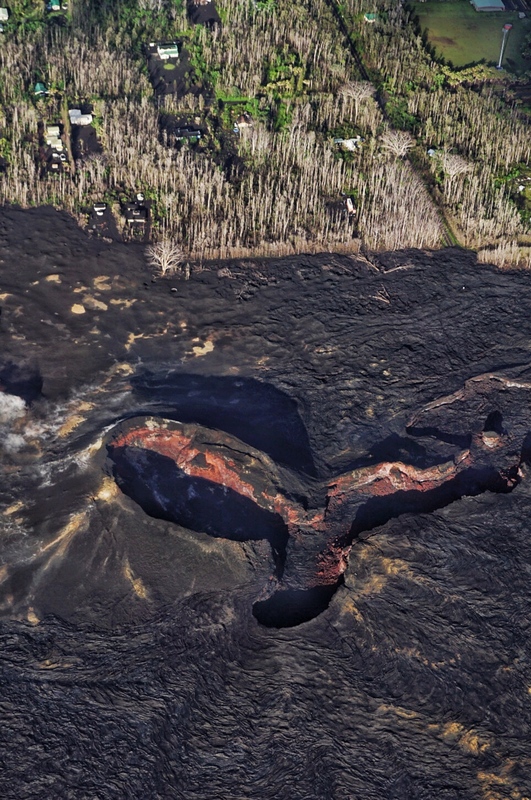 As we got to the edge of the destruction caused by the most recent lava flow from fissure 8, we felt the power of mother nature to our bones. 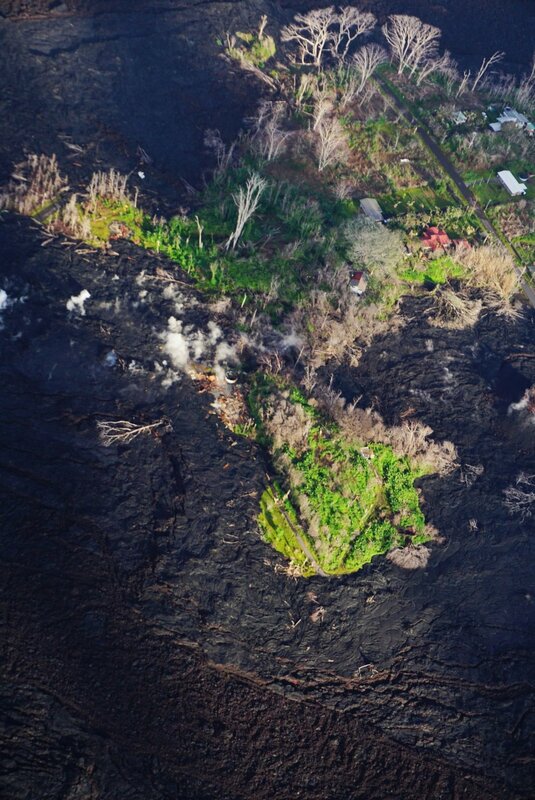 The most recent eruption took out over 700 homes. 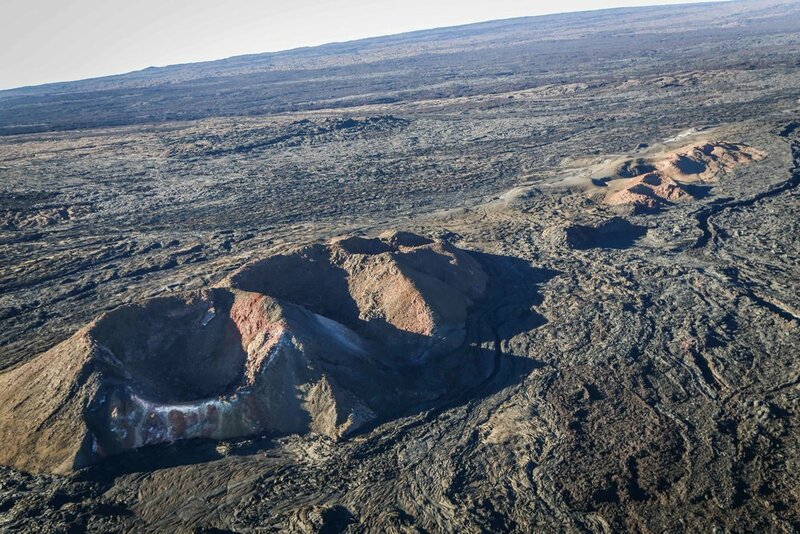 When the helicopter turned up Waipi’o valley I was overwlemend with a feeling of pure awe. The lush neon green faces jutting up from the base of the valley floor were stunning, with jaw dropping waterfalls such as Waihilau Falls boasting a 2,600 foot drop. The four parallel falls were breathtaking and seeing the 13th tallest waterfall in the world by helicopter provided some amazing perspective. We had a few extra minutes to spare so the pilot flew us over the remains of an old B18 bomber from WW2. To finish the tour we flew over the coastline of the Kona and were left with the deepest turquoise blue in our eyes. After you come down from seeing the big island by air, plan to drive the northern road towards Hilo that goes through Waimea. Take the detour to the Waipi’o valley lookout to get a laymen’s view of what you got to witness from the air. If you have time, hike down the floor of the valley for some beach time. Don’t drive you car down unless you have an awesome 4x4 rig, as when the rain hits even capable vehicles get stranded at the base of the valley due to the intense grade. Continue over to Hilo. 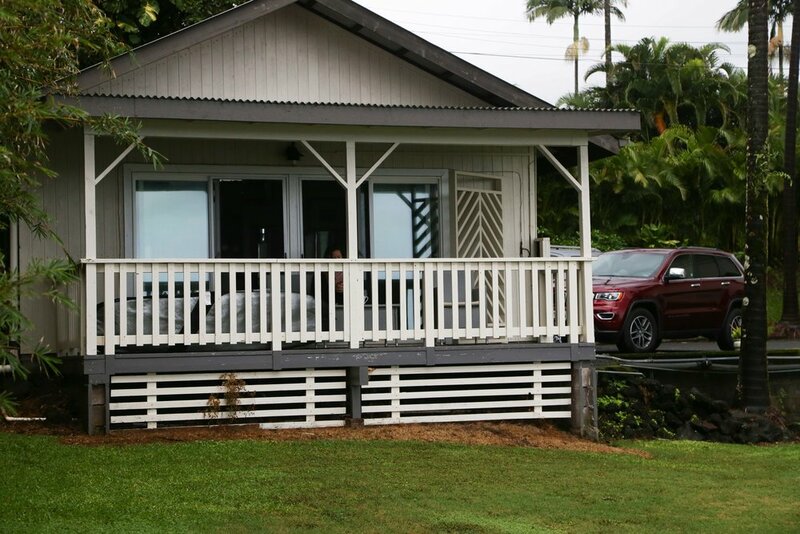 We rented a little cottage right near Hilo’s favorite surf spot Honoli’i. If you’re anything like us, you won’t want to leave this cliff side bungalow where you get lulled to sleep at night to the sound of the lapping waves paired with the song of the coqui frogs. We recommend doing nothing for a while. 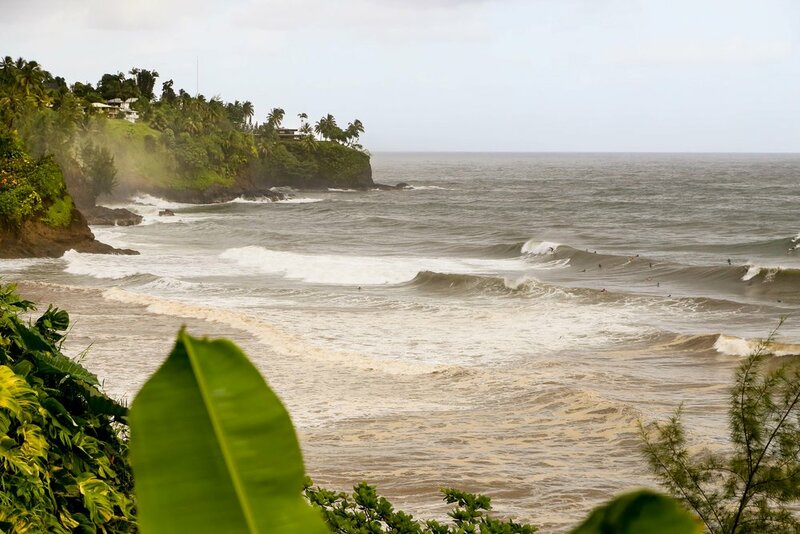 Sip you coffee slowly on the front porch, stroll down the road to Honoli’i beach and watch the surfers. If you’re new to surfing this is not the place to try. There is a strong current with the river flowing out and the waves are fast, but it makes for fun spectating if nothing else. While Dillon was out surfing an out of shape surfer was washed out to sea and had to be rescued. It gets tiring fighting the current constantly so be careful if you venture in, especially with big swell. Depending on what days you end up in Hilo, hit the farmer’s market. It is open daily but the days with the most vendors are Wednesday and Saturday. We scored the most amazing floral arrangement for $6 and perfect papayas for $1 each. On the scenic route (old road) is the Hawaii Botanical Gardens. It is well worth the $20 per person. Walking through the lush wonderland of tropical plants and trees from around the world, ending at a beachfront pathway was a memorable experience. 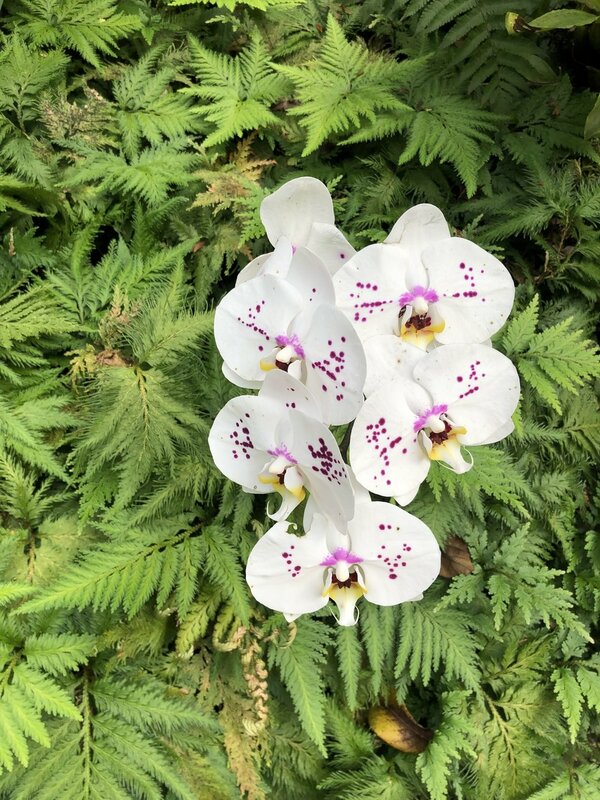 Don’t miss the waterfalls and orchid garden. The happy hour at Jackie Rays in downtown Hilo has a killer happy hour from 3-5. The Mai Thai’s claim to be the best on the big island, and the Hawaiian margarita was delightful. The most delicious Ahi Tar Tar was $5, as were the pork spring rolls. Yum! If you’re looking to lounge poolside, check out the restaurant at the Grand Naniloa Hilton on the water in Hilo. Technically the pool is only for guests, but nobody seemed to mind when we walked up and spread out on a lounge chair poolside and ordered drinks. The pool is located six feet from the ocean. After cocktails by the pool, head to Sac N Save for some amazing poke. Ask for a sample to figure out which style you like best. Take your poke to go for a picnic at 4 mile beach (Carlsmith beach park) to snorkel with the turtles. Installing 200 Watts of solar from Renogy Solar on our roof! Our journey throughout Central America in the VW Bus. Our travels through mainland Mexico in our 1975 VW bus.